In the 2016 United States presidential election, ten members of the U.S. Electoral College voted for a candidate different from whom they were pledged to vote. This movement, dubbed the "Hamilton Electors", was co-founded by Micheal Baca and Bret Chiafalo. The movement attempted to find 37 Republican electors willing to vote for a more moderate Republican in an effort to put country above party. Three of these votes were invalidated by their respective states, reverting to the pledged candidate. As a result, the Democratic Party nominee, Hillary Clinton, lost five of her pledged electors while the Republican Party nominee and then president-elect, Donald Trump, lost two. Three of the faithless electors voted for Colin Powell while John Kasich, Ron Paul, Bernie Sanders, and Faith Spotted Eagle each received one vote. The three additional electors who initially voted against their Clinton pledge had their votes invalidated according to local statutes and were replaced or forced to vote again. The defections fell well short of the number needed to change the result of the election; only two of the seven defected from the presumptive winner, when 35 were needed to defect in order to force a run-off vote by congress (a tally of less than 270). 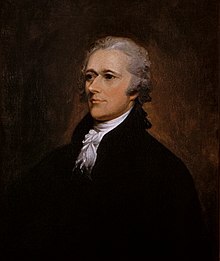 Although there had been a combined total of 167 instances of individual electors voting faithlessly in over two centuries of previous US presidential elections, 2016 was the first election in over a hundred years in which multiple electors worked to alter the result of the election in order to "vote their conscience for the good of America" in accordance with Alexander Hamilton's Federalist Paper No. 68. Electors were subjected to public pressure, including death threats. Seven electors successfully cast faithless ballots for president, the most to defect from presidential candidates who were still alive in Electoral College history, surpassing the six electors who defected from James Madison in the 1808 election. Historically, this number of defections has been exceeded only once. In 1872, a record 63 of 66 electors originally pledged to losing candidate Horace Greeley cast their votes for someone else (Greeley had died between election day and the meeting of the Electoral College). 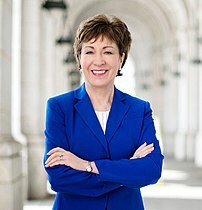 The six faithless vice-presidential votes in 2016 is short of the record for that office, without considering whether the vice-presidential candidates were still living, as multiple previous elections have had more than six faithless vice-presidential votes; in 1836, faithless electors moved the vice-presidential decision to the U.S. Senate, though this did not affect the outcome. The electors themselves are named on the presidential ballots of only eight states. In the indicated states, laws exist which either impose a fine on an elector who fails to vote according to the state-specified rules, force the elector to vote for the candidate they pledged to vote for, or disqualify the elector and provide a replacement. In the unique system of presidential elections of the United States of America, which was established as a republic (representative democracy), the president is not determined directly by the popular vote of the national electorate, but indirectly through the mechanism of the Electoral College determined by cumulative wins of the popular votes of state electorates. 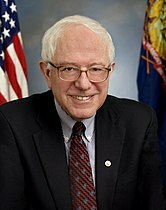 In this system of representative democracy, a presidential candidate is deemed to have won a presidential race if that candidate wins a simple majority of the electoral college vote. Electors are selected based on a state-by-state basis; some states choose as electors all people who are pledged to vote for the winner of the popular vote within the state, while other states apportion their electors based on the outcome of their populace's presidential votes. The electors, once selected, are free under federal law to vote for a candidate other than the one for whom they were pledged. 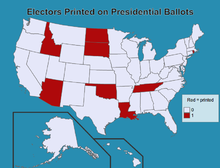 Twenty-nine states, however, have state laws requiring their electors to vote for their pledged candidate, but the Constitutionality of those laws has not been ruled on (they are currently being challenged), while the supremacy clause established by the Constitution provides that state courts are bound by federal law in the event that state law were to contradict federal law. Only four times in American history (1876, 1888, 2000 and 2016) has a presidential candidate lost the popular vote but achieved the electoral college majority, thereby assuming the presidency; in the last three such cases, no candidate polled an absolute majority of the popular vote. In an additional case (1824) the candidate with the highest popular vote (Andrew Jackson) also had the most electoral votes but, crucially, did not have a majority in the Electoral College. Despite John Quincy Adams's having lost the popular vote and having received fewer electoral votes than Andrew Jackson, the House of Representatives chose Adams to become President. In the event that no one candidate receives a majority of the Electoral College vote, the selection of the president is made by the House of Representatives under certain Constitutional guidelines. In the 2016 election cycle, the threshold of 270 electoral votes to win the presidency outright could have been thwarted by garnering a minimum of at least 12% of all Republican electors to become faithless, that is, 37 of 306 Republican electors. However, critics have noted, garnering this many electors would be extremely unlikely, as electors vote more than 99% of the time as pledged. As of December 5, 2016, several members of the electoral college, seven from the Democratic Party and one from the Republican Party, publicly stated their intention to vote for a Republican other than the nominee Donald Trump, at the Electoral College vote on December 19, 2016. Texas Republican elector Christopher Suprun publicly pledged to not cast his vote for Donald Trump as allowed by Texas state law. For a complex of legal reasons, the four Colorado voters did not end up casting faithless votes. By December 5, 2016, two Republican electoral college members who publicly stated their intention to not vote for Trump had resigned. Texas Republican elector, Art Sisneros, willingly resigned in November rather than vote for Trump. Georgia Republican elector, Baoky Vu, had resigned in August in the face of reaction to his public statement that he would not vote for Trump. Both Sisneros and Vu served in states that lacked any laws preventing electors from voting their conscience. Although it is difficult to ascertain how many more electors, especially Republican electors, considered becoming faithless and voting for a Republican other than Trump, it was reported that at least an additional 20 Republican electors had already accepted the free-of-charge anonymous legal counsel and support provided for Republican faithless electors to assist them in voting against Trump. On December 13, 2016, Lawrence Lessig claimed that up to 20 Republican electors would be willing to vote against then President-elect Donald Trump, or more. However he did not provide evidence to corroborate this number. Suprun indicated that he had also been in confidential contact with several Republican electors who planned to vote faithlessly, stating that they would be "discussing names specifically and see who meets the [fitness for president] test that we could all get behind." The Republican National Committee mounted an expansive whip operation to ensure that all those electors selected to vote for the Republican nominee indeed did so. On December 14, multiple Republican members of the electoral college stated under condition of anonymity that they were being coerced with "threats of political reprisal," adding "that the Donald Trump campaign is putting pressure on Republican electors to vote for him based on . . . future political outcomes based on whether they vote for Donald Trump or not." On December 14, the "Unite For America" campaign released a video published on YouTube and other media addressed directly to Republican electors urging that each of them individually, plus 36 of their colleagues (at least 37 Republican electors in total), vote for a Republican other than Donald Trump for President. The video featured numerous public figures including Debra Messing, Martin Sheen and Bob Odenkirk, urging Republican electors to prevent a Trump Presidency, expressing several times the message: "I'm not asking you to vote for Hillary Clinton". In electing an alternative Republican, the featured speakers ask the elector to become an "American hero" by using the elector's constitutional "authority" to give "service and patriotism to the American people" through a vote of "conscience." Daniel Brezenoff's anti-Trump Change.org petition became the largest in that organization's history with nearly five million signatures, and on December 14, full-page ads funded by Brezenoff's related GoFundMe campaign ran in the Washington Post, Philadelphia Inquirer, Austin American-Statesman, Salt Lake Tribune and the Tampa Bay Times. Full-page ads ran the next day, December 15, in the Atlanta Journal-Constitution and the Wisconsin State Journal. On December 11, Democratic U.S. Representative Jim Himes (CT) wrote on Twitter that Trump is "completely unhinged" and "the Electoral College must do what it was designed for." Himes said he made the plea to the Electoral College because Trump refused to say that the Russians hacked Democrats during the election. On December 6, 2016, the Hamilton Electors' website was established to advocate the election of an alternative Republican as the next President of the United States. Lawrence Lessig, a prominent Harvard University law professor (and former candidate for the Democratic presidential nomination himself), announced that he was "teaming with a California-based law firm to offer legal support for any members of the Electoral College seeking to oppose President-elect Donald Trump." Lessig said the counsel and support (namely Laurence Tribe, who has argued before the Supreme Court thirty-six times) would be provided anonymously. Lessig and Boston attorney R.J. Lyman created a nonprofit organization called Electors Trust to provide potential faithless electors with pro bono legal assistance. In states with laws against faithlessness, depending on individual states, voting faithlessly despite the laws may incur anything from no prescribed punishment, to simple removal and replacement of the intended faithless elector, to fines and the potential imprisonment of the elector. Democratic electors filed lawsuits in Colorado, Washington state, and California, but federal judges declined to make restraining orders blocking these laws, and there was insufficient time to appeal to the U.S. Supreme Court before the electoral college vote. However, a three-judge panel of the U.S. 10th Circuit Court of Appeals declared in a footnote that any attempt to remove electors "after voting has begun" would be "unlikely in light of the text of the Twelfth Amendment." 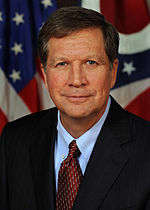 While the constitutionality of faithless electors has never been addressed by the Supreme Court, in Ray v. Blair, 343 U.S. 214 (1952) the Court ruled in favor of state laws requiring electors to pledge to vote for the winning candidate in order to be certified as electors, as well as removing electors who refuse to pledge. In his dissent, Justice Robert H. Jackson wrote: "no one faithful to our history can deny that the plan originally contemplated what is implicit in its text – that electors would be free agents, to exercise an independent and nonpartisan judgment as to the men best qualified for the Nation's highest offices." Clinton/Kaine Faith Spotted Eagle (D-SD) Winona LaDuke (G-MN) Robert Satiacum Jr.
Sanders received the votes of two additional faithless electors, those of David Bright in Maine and Muhammad Abdurrahman in Minnesota. Both had their votes invalidated under their respective states' faithless elector laws; Bright was ordered to cast his vote for Clinton and obliged, while Abdurrahman was replaced by an alternate elector. Abdurrahman also cast his Vice Presidential ballot for Representative Tulsi Gabbard of Hawaii. In Colorado, Michael Baca cast his vote for Kasich. Like Abdurrahman and Bright, his vote was invalidated. 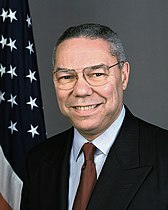 Republican Secretary of State Wayne W. Williams immediately replaced Baca with an elector who cast her vote for Clinton. ^ Julia Boccagno. "Which candidates did the seven "faithless" electors support?". CBS News. ^ "Electoral College Faithless Elector Foiled Trying To Vote For Bernie Sanders". Huffington Post. December 19, 2016. Retrieved September 26, 2018. ^ "'Faithless elector' dismissed, Minnesota's 10 votes go to Clinton". MPR News. February 15, 2016. Retrieved September 26, 2018. ^ Eason, Brian. "Colorado's electoral votes go to Hillary Clinton after one is replaced". The Denver Post. Retrieved September 26, 2018. ^ "Faithless Electors". Fair Vote. ^ Sherlock, Ruth (December 18, 2016). "Thousands send letters, death threats, to pressure Electoral College to avert outcome of presidential election". ^ "Electoral College sees record-breaking defections". POLITICO. Retrieved December 20, 2016. ^ "2004 Electors for President and Vice President of the United States". TheGreenPapers.com. 2004. ^ "THE ELECTORAL COLLEGE". National Conference of State Legislatures. ^ a b Cheney, Kyle (December 5, 2016). "Lessig, lawyers to offer support to anti-Trump electors". Politico. ^ "No, the Electoral College won't make Clinton president instead of Trump". Vox. ^ "Will There Be Faithless Electors In 2016? It's Unlikely They'll Change The Election's Outcome". Bustle. ^ "How Does the Electoral College Work?". New York Times. ^ Pilkington, Ed (November 30, 2016). "Teen becomes seventh 'faithless elector' to protest Trump as president-elect". The Guardian. ^ Pilkington, Ed (December 5, 2016). "First Republican 'faithless elector' announces intent to vote against Trump". The Guardian. ^ Suprun, Christopher (December 5, 2016). "Why I Will Not Cast My Electoral Vote for Donald Trump". 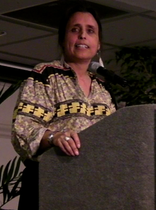 ^ Zimmerman, Neetzan (November 28, 2016). "Republican elector chooses to resign rather than vote for Trump". The Hill. ^ Steve Inskeep, host (December 7, 2016). "Texas Elector Resigns, Saying He Can't Vote For Trump In Electoral College". NPR. Retrieved December 29, 2016. ^ Galloway, Jim (August 3, 2016). "An Electoral College revolt against Donald Trump is quickly quashed in Georgia". Atlanta Journal-Constitution. ^ "How 'faithless electors' are messing with our electoral maps, explained". The Washington Post. 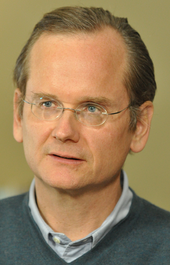 ^ a b "Lessig: 20 Trump electors could flip". POLITICO. Retrieved December 18, 2016. ^ Rozsa, Matthew. "The Hamilton Electors don't have enough Republicans to stop Trump — but they're getting there". Salon. Retrieved December 18, 2016. ^ Richardson, Valerie (December 14, 2016). "Harvard prof advising electors says 20+ Republicans may vote against Trump". The Washington Times. ^ "Harvard law professor says Republican electors close to blocking Trump win". The Independent. December 14, 2016. Retrieved December 18, 2016. ^ "Why an electoral college coup to stop Donald Trump isn't at all likely, Part 59". The Washington Post. Retrieved December 18, 2016. ^ Gradison, Robin (December 9, 2016). "'Rogue' GOP Elector Says Others Will Join in Opposing Trump". ABC News. ^ Cheney, Kyle (December 13, 2016). "RNC keeps close tabs on Electoral College vote: GOP effort makes sure Republican electors don't go wobbly on Trump". Politico. ^ Rozsa, Matthew. "Source: Donald Trump's campaign is threatening "political reprisal" for defecting Republican electors". Salon. ^ Broomfield, Matt (December 14, 2016). "Donald Trump is "threatening" rebel Republican politicians". The Independent. ^ a b Unite For America (December 14, 2016). A Message for Electors to Unite For America. YouTube. ^ "Watch Debra Messing, Martin Sheen and Other Stars Urge Electors to Prevent a Trump Presidency". December 15, 2016. ^ Cheney, Kyle (December 14, 2016). "Full-page ads turn up the heat on Trump electors A pro-Clinton activist is running newspaper ads in Philadelphia, Austin, Salt Lake City and Tampa Bay". ^ Himes, James (December 11, 2016). "Jim Himes Status/808116879558660098". Twitter. We're 5 wks from Inauguration & the President Elect is completely unhinged. The electoral college must do what it was designed for. ^ Halper, Daniel (December 12, 2016). "Congressman begs Electoral College voters to block Trump". New York Post. ^ Cheney, Kyle. "Lessig, lawyers to offer support to anti-Trump electors". ^ Cheney, Kyle. "Lessig: 20 Trump electors could flip". Politico. ^ "Inside The Psychology Of The Rebel Electors Who Seek To Overturn Trump's Election". Fast Company. December 15, 2016. Retrieved December 18, 2016. ^ "Lawrence Lessig Offers Free Legal Aid To Anti-Trump Electors". NPR.org. Retrieved December 18, 2016. ^ Cheney, Kyle (December 16, 2016). "Judge deals critical blow to anti-Trump Electoral College fight". ^ Cheney, Kyle (December 17, 2016). "Court: Removing 'faithless' electors may be unconstitutional". ^ La Corte, Rachel (December 23, 2016). "Four state electors to be fined $1,000 for vote". Kitsap Sun. Retrieved December 25, 2016. ^ Rick Anderson (March 9, 2017). "Washington state's 'faithless' electors are paying the price for defying voters". Los Angeles Times. Retrieved September 26, 2018. ^ Walsh, Sean Collins (December 19, 2016). "All but 2 Texas members of the Electoral College choose Donald Trump". Statesman. Retrieved December 24, 2016. ^ Which candidates did the seven "faithless" electors support? CBS News (December 21, 2016). Retrieved December 21, 2016. ^ (King5), Liza Javier. "VicePresidentBallots". www.documentcloud.org. ^ Electoral College Faithless Elector Foiled Trying To Vote For Bernie Sanders. Huffington Post (December 19, 2016). Retrieved December 19, 2016. ^ Bakst, Brian (December 19, 2016). 'Faithless elector' dismissed, Minnesota's 10 votes go to Clinton. Minnesota Public Radio. Retrieved December 19, 2016. ^ "Colorado's electoral votes go to Hillary Clinton after one is replaced". The Denver Post. Retrieved December 20, 2016.